The legendary Brooklands race track was the first purpose-built motorsports track in the world, and was built in 1907 by Hugh Locke-King on his own property, using his own money, as a rebuff to a British ban on road-course competitions: the same law that inspired competition on the Isle of Man, which opened the same year for TT racing. Even in these early years of motoring, Locke-King foresaw the future of motorsports, as the banked track was designed for speeds up to 130mph, as a time cars and motorcycles could barely top 60mph – hardly enough to justify the near-vertical banking at the top of the track. 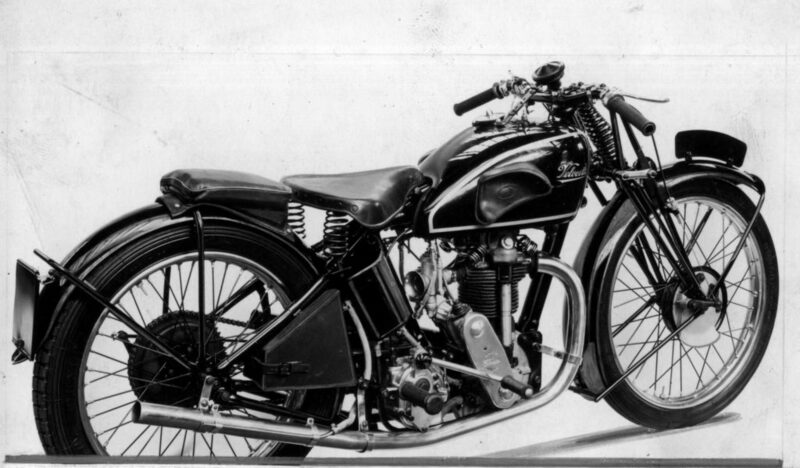 It took until 1913 for a car to reach 100mph at Brooklands, and 1921 for a motorcycle. The construction of the track was a feat in itself, as the banking was created by moving earth by hand, horse, wheelbarrow, and a small temporary railway to build up the 20′ tall berms. After the earthworks were in place, they were paved with concrete 100′ wide, with expansion joints every 20′ or so – a vast patchwork of concrete slabs that became notoriously bumpy as time went on and the earth beneath the track shifted. The ‘outer’ circuit was ~2.8 miles long, and the construction cost Locke-King £150,000: an enormous sum in those days. As speeds increased over the decades, the official sanctioning body for motorcycle racing the BMCRC (‘Bemsee’, the Brooklands Motor Cycle Racing Club) began offering a Gold Star for riders who lapped at over 100mph during a race. The Gold Star was a coveted award, and many riders rented or borrowed motorcycles that had proven capable of the task, in order to add one to their list of achievements. Only 141 riders won Gold Stars at the track between 1922, when the award was inaugurated, and 1939, when the track was appropriated by the military for WW2. They’re a Who’s Who list of mostly British riders of the era, and no doubt every Gold Star has an intriguing story behind it. 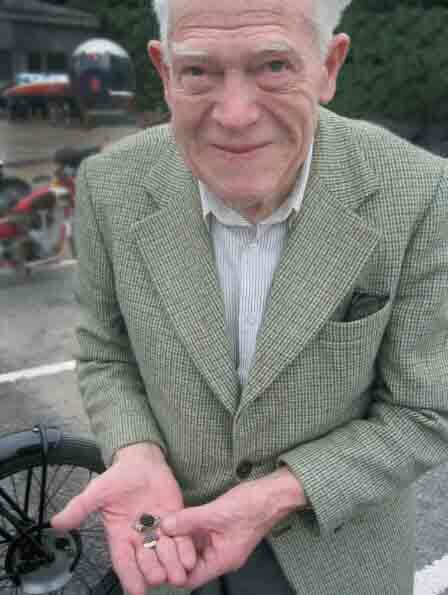 One such rider was David Vincent, who won his Gold Star in 1936, aboard a 1933 Velocette MkIV KTT, running on methanol. 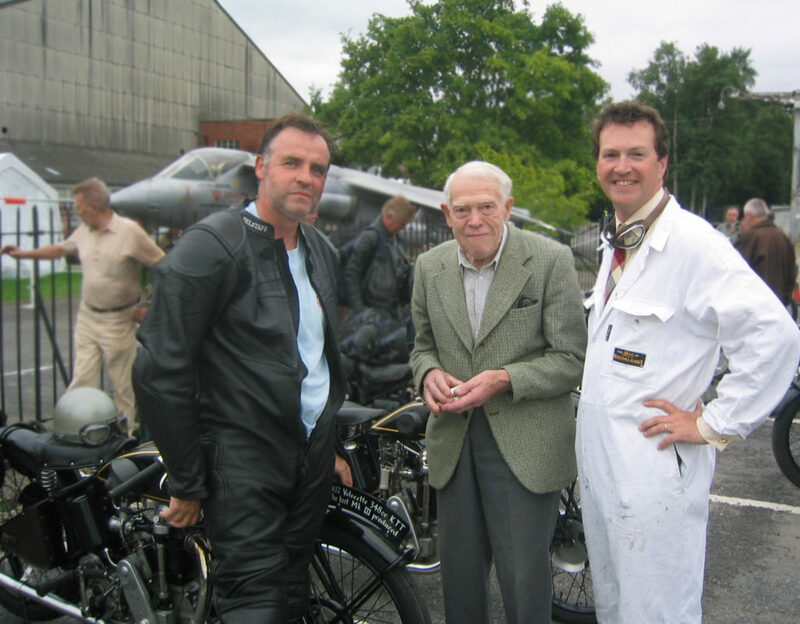 It was my great pleasure to meet David at Brooklands in 2005 during the Velocette Centenary celebrations; he was one of two original Brooklands racers being honored that day (the second being Dennis Loveday). 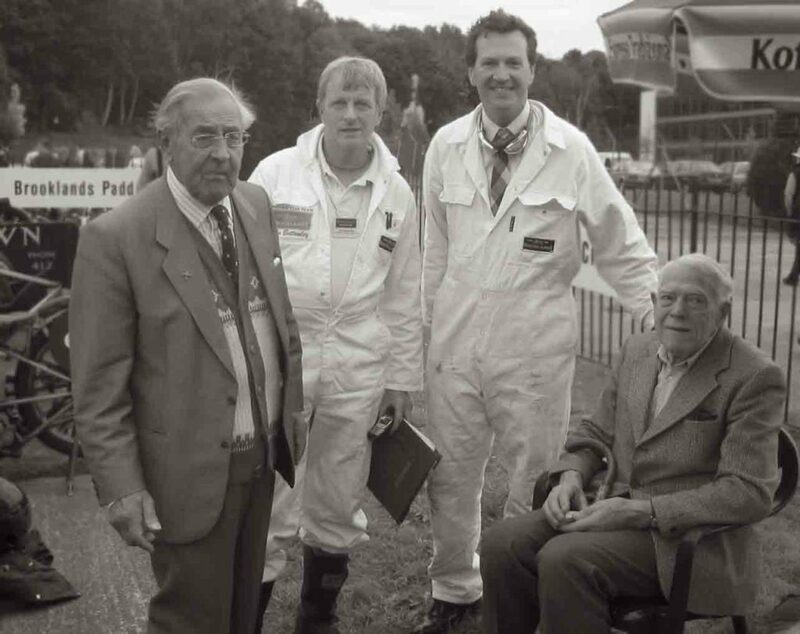 David earned his medal in his second year of competition at Brooklands, and took up racing after his friends grew tired of being blown off by his fast riding: they suggested he try his hand at the local track instead. He began his career on his own Velocette KSS Mk1 roadster in 1934, entering a Clubman’s event in 1934, finishing farther down the field than he thought himself capable! 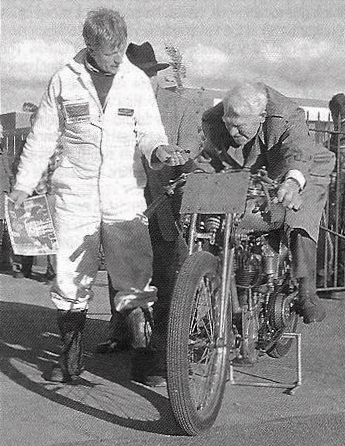 Clearly the KSS wasn’t a true track machine, so he sought out a proper racer, and purchased a MkIV KTT from Harry Lamacraft, a well-known Brooklands habitue, who had previously sold an earlier Velocette racer (a Mk1 KTT) to Bert Perryman, who wrote about his experiences in his excellent memoir (from which I’ve borrowed the name for this article) ‘A Clubman at Brooklands’ (Haynes, 1979). 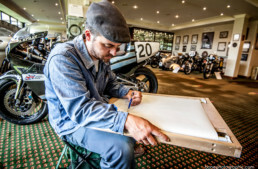 The Lamacraft bike that David purchased was already two years old, but within the season he’d gained his coveted Gold Star: quite an achievement on a 350cc bike, as only 29 racers were so honored, compared to one hundred aboard 500cc machines, 25 on 1000cc, three on sidecars, and only ONE on a 250cc machine – MB Saunders in 1933. 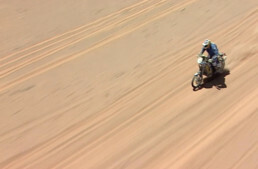 Two riders won ‘double Gold Stars’ for lapping at 120mph; Noel Pope and Eric Fernihough, both on Brough Superiors. 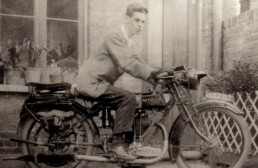 Only one 350cc machine earned a Gold Star using petrol – KTT813 in 1939, ridden by Vic Willoughby (noted moto-journalist and author), which I owned in the 1990s. At the Brooklands event, then-88 year-old David was asked to pose on the Brooklands Museum’s Grindlay-Peerless ‘Hundred Model’, and immediately got down to a racer’s crouch! 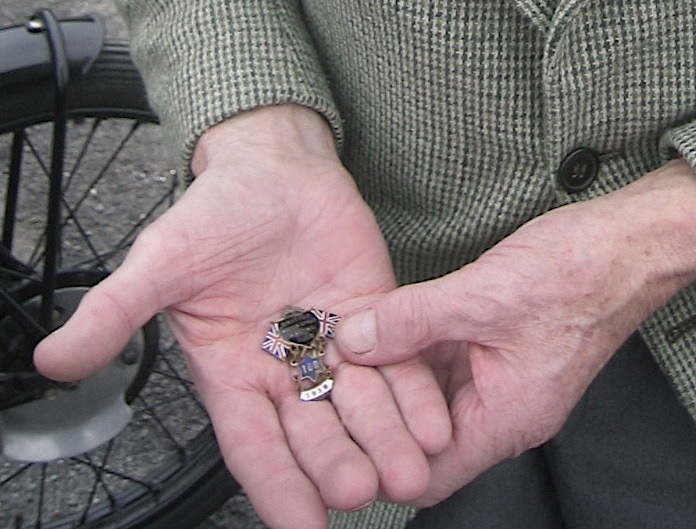 He’d brought along his coveted Gold Star, which he was happy to show off 70 years after winning it, but was slightly dismissive of the ‘gold’ bit – “Pah, it’s brass!” But it was clearly worth more than the metal to its owner, who had a few tales to spin about riding in the Weybridge area in the mid-1930s, when traffic was scarce, and a hot Velocette could blow off anything on the road. i know about Brooklands from a book my dad got for my brother and me,The Boy’s Book of Racing; along with some vintage photos of Mike Hailwood,i remember a pic of Stirling Moss early in his career,behind the wheel of a Formula lll racer powered by a Norton 500 motor; my dad was into SCCA racing in the early ’60s and i think he was trying to instill a love of racing in us…no worries about that! Fantastic article Paul. The thought of going the ton on that bumpy banking riding a machine as light as a KTT is sobering. I love that old racers never give up. Bravo to David Vincent for pulling a speeding ticket at his age. Run through the finish. Ha!